When it comes to relaxation, it’s all about spa-worthy bath essentials. 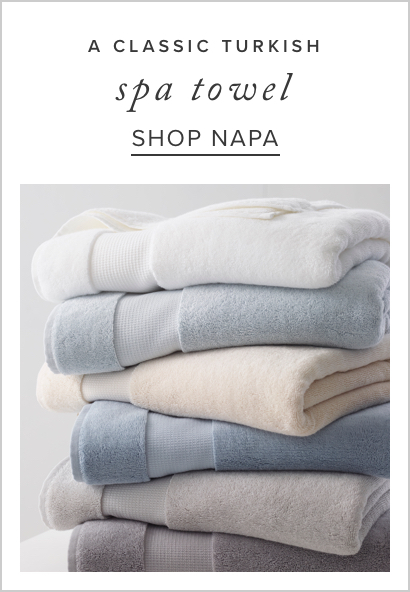 Inspired by fine Turkish towels, explore our bath towels collections for a classic look. Our towels, with it's lofty, absorbent and quick to dry construction, are one of the best around. Expertly engineered, they won't fade, fray or wear out. An embroidered motif, borrowed from one of our best-selling sheets, adds a pretty design detail to a pure white ground. Bring everyday style and luxury to the bathroom with the Serena & Lily bathroom collection, and add spa-like indulgence to every morning and night.